Are you starting to notice the appearance of fine lines and wrinkles on your face? Or, do you feel like you’re looking tired, tense or sad? 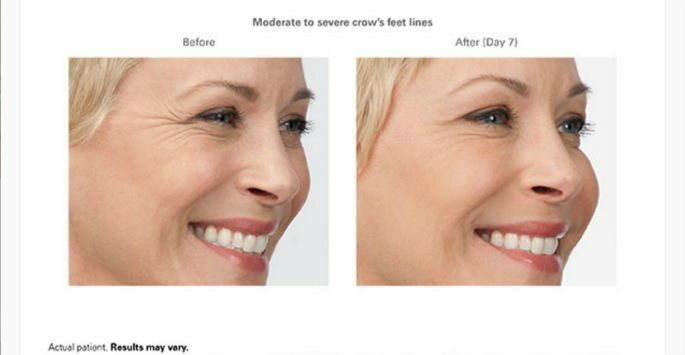 This may be a great time for you to start diminishing fine lines, refresh a tired appearance, or just get a jump start to preventing those “11’s” or crow’s feet. To target these concerns, we invite you to learn more about BOTOX® and Dysport®. BOTOX® and Dysport® will relax facial muscles that are responsible for the development of many fine lines and wrinkles. With a comprehensive knowledge of facial anatomy and physiology, our Aesthetic Nurse Specialists will carefully and skillfully inject BOTOX® or Dysport® into the targeted muscles right for you. In addition to minimizing the appearance of lines and wrinkles around eyes or between the brows, our practitioners can also use BOTOX® or Dysport® for brow and eye brightening and facial sculpting. BOTOX® and Dysport® can even be used to stop underarm sweating. One of the great things about BOTOX® and Dysport® is the convenience of the treatment. Patients basically do not require ‘down time’. In fact, most everyday activities can be resumed immediately after treatment, making BOTOX® or Dysport® extremely convenient for men and women with busy schedules and lifestyles. It is important to note that the results of BOTOX® and Dysport® are not immediate. However, within a few days following treatment, you can start to see lines and wrinkles in the treatment area diminish. Full results are apparent by two weeks. To maintain your ‘ReFreshed’ look following BOTOX® or Dysport®, our aesthetic practitioners recommended re-treatment within 3-4 months. The Aesthetic Team at ReFresh Aesthetic Center strives to help you achieve your own aesthetic goals. Schedule a consultation at our office in Whitefish Bay for a comprehensive facial analysis. From there, we can help you determine if BOTOX® or Dysport® is the right treatment for you. We will also educate and guide you on other aesthetic products or procedures that you may benefit from. Contact our office today to schedule an appointment to learn more about your treatment options!